Deep in the forested hills of Vinton County stands one of the most legendary railroad tunnels in the world. 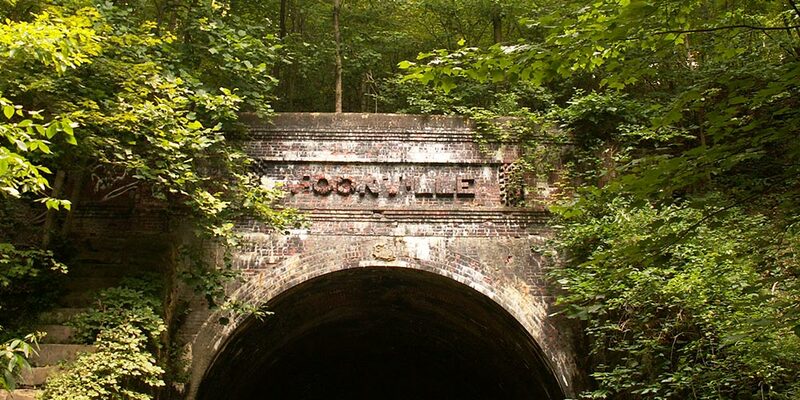 According to age-old lore, the Moonville Tunnel is haunted by spirits who met their untimely deaths at this site. Once a booming village, little remains of Moonville other than a small cemetery, the tunnel, and the stories of eerie brushes with unknown beings. It is these legendary tales that cause ghost hunters and thrill seekers from all over the world to visit the Moonville Tunnel. What are we to think of these bone-chilling tales? Is it possible that at least two ghosts remain at Moonville and allow themselves to be seen by visitors? Witnesses reveal the same details when recounting the ordeal of meeting the more popular of the two: a man, standing close to 8 feet tall with a white beard, seeing with eyes that glisten like balls of fire from under what appears to be a miner’s hat. Dressed in dirty overalls, he swings a glowing lantern when one nears the tunnel and, according to some accounts, releases a blood-curdling scream. The second ghost has appeared to many in two forms. Some have seen a shapeless entity, while others report a woman dressed in clothes of an earlier time. Accounts differ on several points regarding this apparition, but many witnesses report smelling lavender when she passes by. Is it possible that these ghosts and other reported spirits are roaming around Moonville looking for something or some way to take care of unfinished business? The answer may be found nowhere else but in the midst of a sleepless night on the eastern edge of Vinton County. The Moonville Rail Trail Association invites you to visit the Moonville Tunnel and decide for yourself. The organization is working to convert the former B&O railroad bed into a 16-mile muscle-powered trail system that caters to walkers, bicyclists, and horseback riders. Watchmen at Hope Furnace were employed day and night to monitor the fires and keep watch on company property. They could be seen carrying lanterns throughout the night. One such watchman stumbled into the open top of the furnace and was incinerated by the molten iron ore within. Ever since, visitors after dark have reported seeing a ghostly specter carrying a lantern on top of the furnace.